Most of us have old tapes and cine film lying around, covered in dust, neglected and forgotten, unable to be watched because we simply don’t have the equipment to play them on any more. But it doesn’t have to be like this. These moments were captured on video so we could enjoy them again for years to come, to share with future generations, not sit forgotten in the back of a cupboard. Weddings, children growing up, holidays with the family – these are special times and they deserve to be seen! That’s why we are here, to give new life to your old home movies. We want to help you and your family enjoy these treasured memories again. We take your old video tapes and cine films and convert them to either DVD or digital file. VHS, Betamax, Camcorder tapes – we can do them all! Some people just want to play their old movies again, while others will want to be able to edit them at the highest quality possible. We offer a service that’s right for each customer’s individual needs. If you’re not sure what you need, just give us a shout – we’re always happy to help. With almost 20 years experience in the professional video, TV and film industry, your memories are in safe hands. Most people have at least one old tape sitting in a the loft gathering dust, unable to be played any more. We can take it and bring those old memories back to life. Oh, and if you give us a tape that’s accidentally been recorded over with “Match of the day” or “Eastenders”, we’ll let you know and won’t charge you anything for it (we’re nice like that). 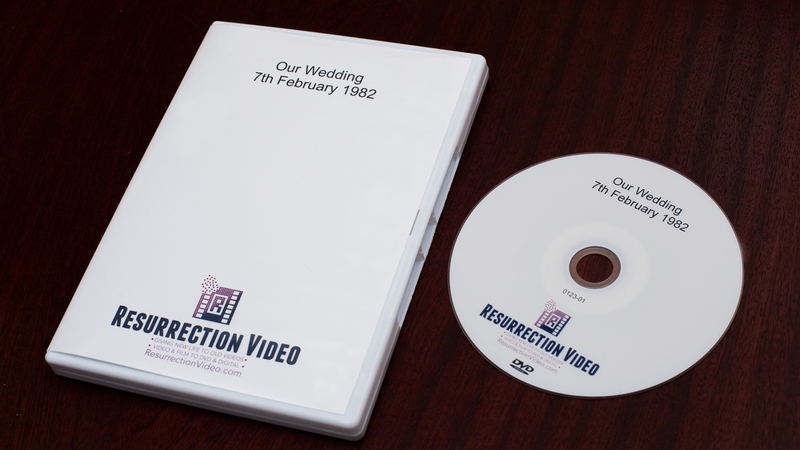 Your DVD will have its title printed on the disc and comes in a full-size hard case with titled cover, unlike many other well-known companies, where your DVD just gets a number stuck onto it before being stuffed into a cheap plastic sleeve. With us, your memories get treated with the care and respect they deserve! Our digital video files are .AVI format, which is ideal if you wish to edit your footage on a PC, or Apple ProRes 422HQ if you’re using a Mac. As these are very large files some older computers may struggle to play them. Alternatively, we can transfer your tapes to .MP4 files. These are smaller files, and are great for just watching your footage on your computer or playing on a smartphone. If you wish to have your footage transferred to a digital file then you can purchase a hard drive from us for £60 500GB drive, or £75 for a 1TB drive (USB 3.0 portable drive). All our drives are formatted to work with both Windows and Apple computers. Otherwise, you can send us your own external hard drive with your tapes/film, along with any power and data cables needed to use it. Obviously, please make sure you package it up carefully, as we cannot be held responsible if it gets damaged in the post. Please be sure that your drive has enough space for all your footage – a 3 hours VHS tape won’t fit onto a 2GB memory stick! MP4 files are about 2.5GB per hour of footage. AVI files are roughly 13GB per hour. Apple ProRes422(HQ) files are approx 17GB per hour. If you have any other specific requirements, please send us a message using the “Contact Us” page. For a full list of which formats we can convert from, take a look at our “Tape Formats” page. We are also happy for you to drop your tapes off to us by hand, and collect them in person when they’re finished. Our address is: 97 Elmwood Way, Basingstoke, Hampshire, RG23 8LJ. Click here to find us on Google Maps.